Cirrhosis (sir-RO-sis) damages liver cells and replaces them with scar tissue that prevents the normal flow of blood through the liver and interferes with many of the liver's vital functions. Many people believe that only heavy drinkers can get cirrhosis of the liver. Although it is true that the number one cause of cirrhosis in the United States is drinking alcohol, a person need not be a heavy drinker to get the disease. The chance of developing cirrhosis depends on the amount and frequency that a person drinks, as well as their weight and height, and their body's ability to metabolize, or process, alcoholic products in the blood stream. varies with each person. If cirrhosis is not treated, it can eventually lead to liver failure, or death. The liver is a large, complex organ, about the size of a football and weighing around three pounds. It is located beneath the ribs in the upper right side of the abdomen, and is connected to the small intestine by the bile duct, which transports bile * from the liver to the intestines. A healthy liver is soft and smooth. The liver is one of the most important organs, serving as the body's most comprehensive chemical factory and refinery. Almost all of the blood that leaves the stomach and intestines passes through the liver. The liver is responsible for cleansing the body of toxic or poisonous substances; processing nutrients, hormones, and medications; and for making proteins and clotting * factors that are crucial to healing. In a person with cirrhosis, toxic substances and bile remain in the bloodstream, because the liver has not removed them. Drinking alcohol: The most frequent cause. About one third of all heavy drinkers eventually will develop cirrhosis; the rest may suffer from other forms of liver disease, but not cirrhosis. Chronic viral hepatitis (inflammation of the liver): Hepatitis (usually types B, C, and D) is the second most common cause of cirrhosis. Wilson's disease, which causes a buildup of copper in the liver, brain, kidneys, and eyes. Cystic fibrosis, which causes a buildup of mucus in the lungs, liver, pancreas, and intestines. Hemochromatosis (he-mo-kro-ma-TO-sis), which causes a buildup of iron in the liver and other organs. 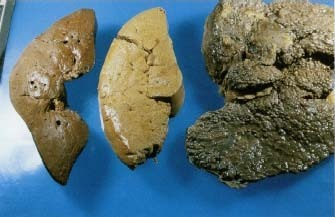 Blockages or inflammation of the bile ducts, called biliary (BIL-ee-ar-ee) cirrhosis. Glycogen storage disorders, which prevent the body from using sugars properly. Reactions to prescription drugs, environmental toxins, and inhalant abuse (sniffing toxic substances). * bile is a greenish-brown fluid manufactured in the liver that is essential for digesting food. Bile is stored in the gallbladder, which contracts and discharges bile into the intestine to aid digestion of fats after a person eats. As less of the protein albumin (al-BYOO-min) is made, water will accumulate in the person's legs (a condition called edema) or abdomen (a condition called ascites) (a-SITE-eez). A slowing down of the production of plasma proteins such as fibrinogen (fy-BRIN-o-jen), essential for blood to clot, makes it easier for a person with cirrhosis to bruise or to bleed. Jaundice, a yellowing of the whites of the eyes or skin, may occur in a person with cirrhosis. This is caused by the buildup of bilirubin (bil-e-ROO-bin) or bile pigment that is normally passed by the liver into the intestines. Some people with cirrhosis also experience intense itching due to the bile products deposited in the skin. Cirrhosis prevents the liver from cleansing toxins, poisons, or drugs from the bloodstream. As these build up, they can lead to changes in mental function and personality. Early signs of cirrhosis may include neglect of personal appearance, forgetfulness, trouble concentrating, or changes in sleeping patterns. Later signs may include loss of consciousness or coma * . Cirrhosis also can affect abdominal blood vessels. Normally, the huge portal vein transports blood from the intestines and spleen through the liver. Cirrhosis blocks the flow, causing a condition called portal hypertension. As the spleen swells, the body attempts to divert blood through other blood vessels. But these new vessels are often not strong enough for the job. If they break, people can vomit blood, a highly dangerous situation. How Do Doctors Diagnose and Treat Cirrhosis? Doctors always begin with a medical history and a physical exam. Evidence of an enlarged or swollen liver; evidence of edema or ascites; and signs of mental confusion caused by the buildup of toxic substances in the brain all can lead a doctor toward a diagnosis of cirrhosis. The doctor also may order CT * or ultrasound * scans of the liver to see if it is scarred. A needle biopsy, in which a needle is put through the skin to take a sample of tissue from the liver, can be useful in diagnosing cirrhosis. The liver also can be inspected through a laparoscope (LAP-a-ro-skope), a viewing device inserted through a tiny incision in the abdomen. The presence of telangiectasia (tel-an-je-ek-TAY-ze-a), which are tiny, expanded, "spidery" blood vessels in the skin, particularly in the face and upper chest, may indicate cirrhosis. About 25,000 people die in the United States each year from cirrhosis. Cirrhosis is the fourth disease-related cause of death in the United States for people aged 24 to 44. Experts estimate that more than half of all liver diseases could be prevented if people acted upon knowledge that is already available. * CT scans are the short form for computerized axial tomography, which uses computers to view structures inside the body. * ultrasound (sonography) uses sound waves to create images of the inside of the body. Treatment depends on the type and stage of the cirrhosis. The goal is to stop the progress of the disease while trying to reverse damage to the liver. If the cirrhosis is caused by alcohol, stopping drinking will be the first step. At the present time, there is no one treatment to "cure" cirrhosis. Symptoms such as itching can be treated with medications. Diuretics (drugs that help remove excess salt and water from the body) also may be prescribed to treat edema or ascites. In severe cases of liver failure, when the liver cells have completely stopped working, a liver transplant may be the only solution. Never mixing drugs, in particular alcohol and over-the-counter medications. Closely following label directions when using chemicals: ensuring good ventilation, never mixing chemicals, avoiding inhaling any chemical products, avoiding getting chemicals on the skin, promptly washing any accidentally exposed area, and wearing protective clothing. Avoiding any type of inhalant abuse. Avoiding intravenous drug use by which hepatitis B, C, and D may spread. People with cirrhosis can live for many years. Even when complications develop, they usually can be treated. Many people with cirrhosis have undergone successful liver transplantation and gone on to live healthy lives. People recovering from cirrhosis are advised not to drink alcohol. Poor nutrition, particularly associated with alcohol or drug abuse, is believed to play a role in how cirrhosis develops, although physicians have yet to understand this completely. In the meanwhile, eating a healthful, well-balanced diet is recommended. U.S. National Digestive Diseases Information Clearinghouse, 2 Information Way, Bethesda, MD 20892-3570. This division of the National Institutes of Health posts a fact sheet about cirrhosis at its website. American Liver Foundation, 1425 Pompton Avenue, Cedar Grove, NJ 07009. The ALF publishes brochures and fact sheets about cirrhosis, biliary atresia, and liver transplantation. The Primary Biliary Cirrhosis Support Group. This is a large internet support group. I would like to thank the people who have gathered this information and put it on the internet it has been very helpful understanding what causes cirrhosis and how to treat it. My father has had it for some years now, and i never knew what it meant now that i have found this web site i now understand more about it. Jesus Christ loves you. He has ressurected from the dead. God bless anyone reading this.